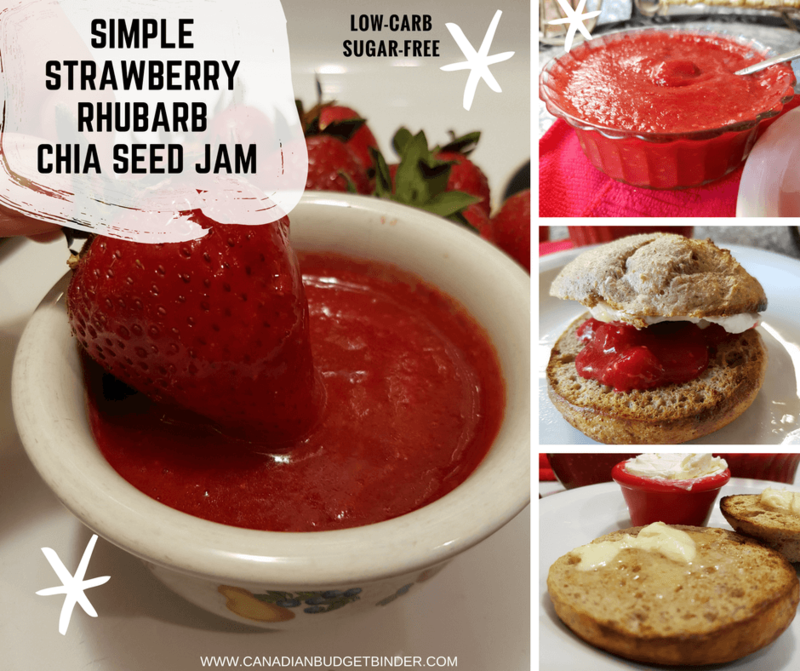 Strawberry Rhubarb Chia Seed Jam comes packed full of nutrients, vibrant red in colour, tart yet sweet and perfect on its own or used as a topping or sauce. Close your eyes right now and imagine a stack of your favourite pancakes dripping with sugar-free syrup and Strawberry Rhubarb Chia Seed Jam. I don’t have to imagine because we’ve tried it and love it! We’ve also made homemade ice-cream with the jam then topped it off with even more of the preserve. It’s all around easy to make and deliciously healthy. What I love about this jam is that you don’t have to slave over the stove nor do any fancy work to get it done. Essentially this is a refrigerator or freezer jam which means you can store it away and enjoy without canning. The process takes about 30 minutes from start to finish but keeping it in the refrigerator over-night is the key to its success. All these years we’ve had this amazing rhubarb growing in our back garden which we presume made its way into the ground about 20 years ago but hardly used. Most years we give it away because we just can’t keep up with the grow as it gives us about 3-4 crops a year. Everyone who visits us always asks about our rhubarb if we are out on the deck enjoying a beverage because it just stands out. Just recently we gave a load to our neighbour and then a couple who came to pick apples from our mature, large tree that we also struggle with. There is really only so much bounty a family can eat so we like to pass it on to friends or just about anyone who wants it. The first couple of years after we moved in our house Mrs. CBB and I made lots of crab-apple spice jelly which we still have in our cellar. We also used the jelly to make gifts for a baby shower which was simple and the guests loved. It’s amazing jelly but it has sugar so we haven’t been into it for a while so we give it away when friends come around. Before the jelly making we also made a lovely Rhubarb Cherry Applesauce and Rhubarb Blueberry Sauce which we used on pancakes, waffles and stuffed in crepes. Since Mrs. CBB has enjoyed her low-carb high fat diet cutting out the sugar and lots of the carbs we haven’t taken much notice to the rhubarb until we found out it is great for those on a low-carb diet. Generally though if you are in the induction phase of a low-carb diet such as Atkins you will want to avoid all fruits apart from avocado or avocado oil. 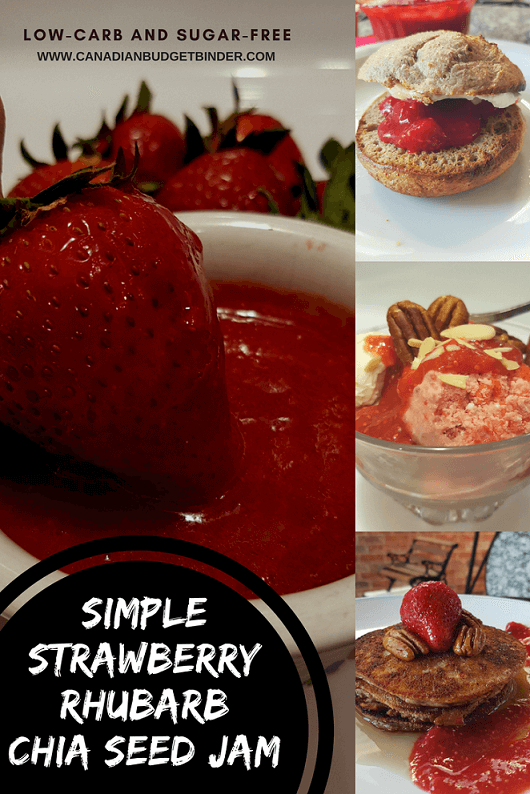 After induction introduce low-carb fruits *see printable list at Low Carb Diem. Other great low-carb fruits include strawberries, guava, blueberries, blackberries, raspberries Our favourite fruits to eat are blueberries, strawberries and blackberries. Chia seeds taste like nothing BUT come packed full of dietary fiber and Omega-3 Fatty Acids and whether you use the black chia seeds or the white chia seeds they both offer the same nutritional value. You can use chia seeds raw or cooked without losing any nutrition. We’ve tossed them on salads and made sugar-free chia pudding that we rest overnight in the refrigerator and enjoy the next day. 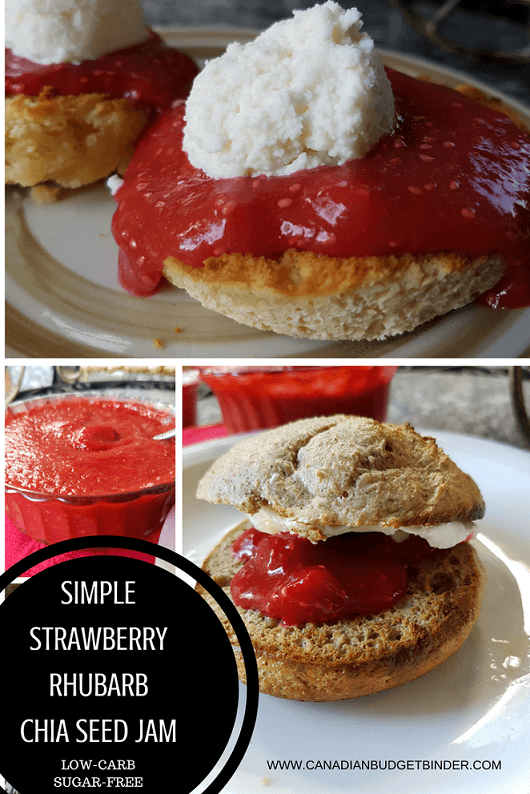 The pudding was our inspiration for Strawberry Rhubarb Chia Seed Jam plus the chia seeds reflect the seeds on the outer side of the strawberry which gives the jam depth. Initially we made a batch of the jam without the chia but then Mrs. CBB suggested we toss a 1/4 cup in and see what happens. Perfect! It worked great. We have a bag of both the white and Nutiva Organic Chia Seeds Black, 32 Ounce because you will want to use them in recipes differently mainly for colour I suppose. With the Strawberry Rhubarb Chia Seed Jam you could use either white or black chia seeds and it would still look and taste gorgeous. We purchased a bag of Viva Naturals Organic Chia Seeds Bag, 2 Pound from Amazon for a reasonable price at $15.99 but it lasts a long time. The Viva brand is widely known and they have a wonderful line of Organic products. You can also purchase Chia seeds at most health food stores but all prices and quality are different which is why we went with Viva or Nutiva brand which is as good. When making this Strawberry Rhubarb Chia Seed Jam it’s important to have a couple of containers handy or even mason jars which we used to store them. Make sure they are clean and dried so you can pour the jam in while it is hot then seal the jar. Once refrigerated and cooled overnight you can enjoy it on your favourite foods or freeze it for later use. Just give it time to defrost before using. 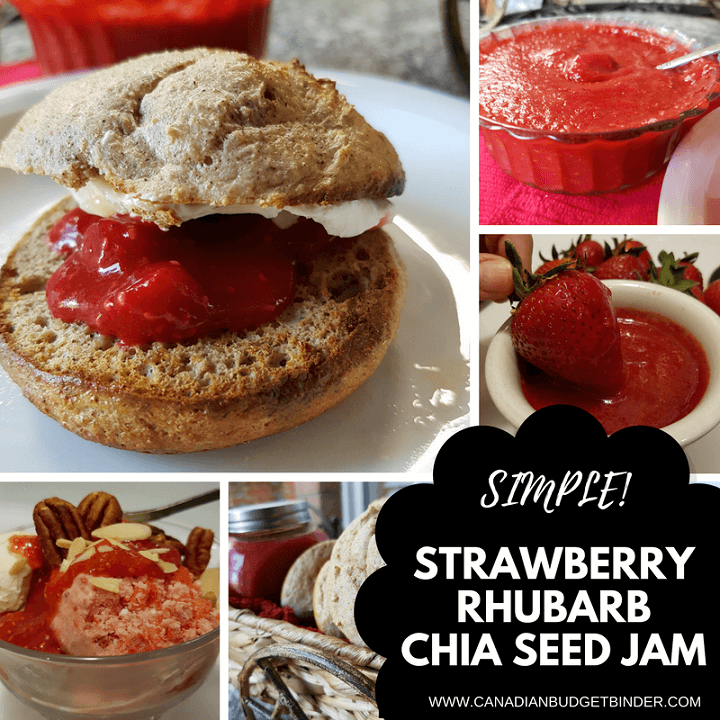 This Strawberry Rhubarb Chia Seed Jam is not only nutritious and packed full of flavour but it takes no time at all to make. You will be enjoying this jam the next day! In a medium sized pot on medium heat then add 1 cup of cold water and your chopped rhubarb and salt then bring to a boil for 10 minutes on high heat or until tender. Add the strawberries and cook for 10 more minutes. Add the sweetener of choice, lemon juice and xanthan gum and stir it in. Remove the pot from the burner and use a hand blender to blend it up together. Finally add in your chia seeds and hand mix. Pour into your prepared jars or containers.Generally we get 2-3 small mason jars. Refrigerate overnight and enjoy the next morning. Depending on the size of jars you use your yield will be different. 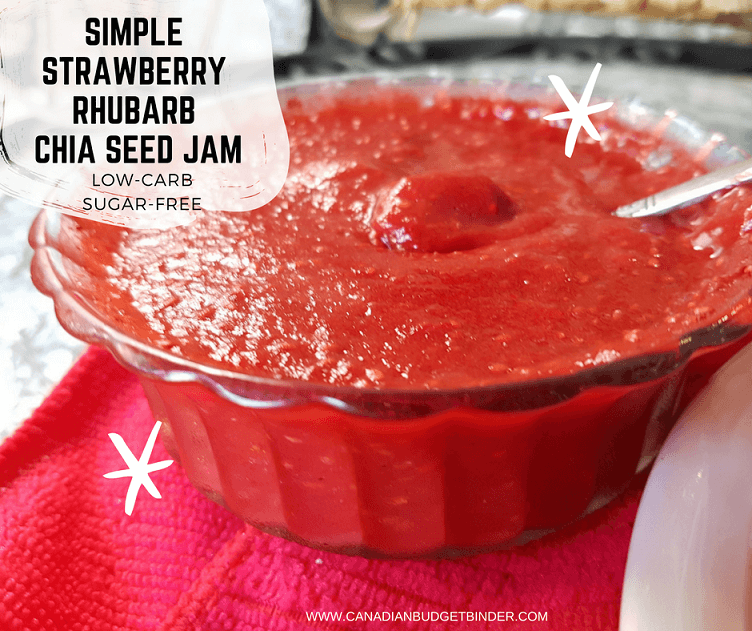 Feel free to test the sweetness of your Strawberry Rhubarb Chia Seed Jam before you store it as you can add more if you feel it’s to tart for your liking. Please note if you add or take away ingredients that the nutritional values will change. What does the xanthan gum do for this jam? Can I leave it out or replace it with something else? It’s a thickening agent used in keto and low-carb baking and cooking. I’m not sure of any other thickening replacements at this time. You can buy it at Bulk Barn, Amazon and even at the grocery store in the health food section for about $6-7.